Dr. Mel Pender is a decorated war combat veteran and retired military officer. He is also an Olympic gold medalist, entrepreneur, community leader and public speaker who has impacted lives and inspired young people the world over. Including me. When I was 12 years old, I was fortunate enough to be mentored by him. He was my track coach, and his influence, life philosophy and training helped shape the man and business owner I would become. I want to pay forward some of the wisdom he gifted to me. Dr. Pender and I are about 30 years apart in age. On November 5, 2017, just a week after I turned 53 and he turned 80, the Georgia Institute of Aging and LeadingAge Georgia presented Dr. Pender with the 2017 Positive Aging Icon Image Award. The award recognizes distinguished Georgians for their selfless contributions to society at every stage of life, and honors their lifelong experiences shared with other generations. I learned of Dr. Pender’s award while I was going through the nomination and acceptance process in becoming a member of the Georgia Humanities board of directors. Laura McCarty, executive vice president of Georgia Humanities, had just written an exceptional article entitled, Leadership through service and hope—the Melvin Pender story. Reading that article brought back memories of my childhood coach through today’s eyes, and made me appreciate his life of service even more. Dr. Pender was born in 1937 in Atlanta. He entered the Army as an enlisted man in 1955, when he was 17, and in 1976 he retired at the rank of Captain. He received the U.S. Armed Forces Bronze Star Medal for his service in Vietnam. 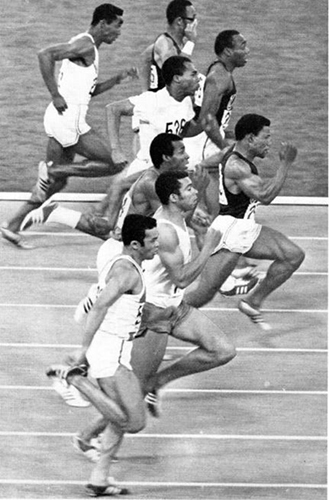 At age 25, Mel Pender discovered his talent for track and field as a sprinter. As his military career progressed, his career as a world class athlete also flourished – in time. During his first (of two) tours in Vietnam, Mel Pender was pulled out of Vietnam by the Army Sports Branch to train and compete in the 1968 Olympics in Mexico City. 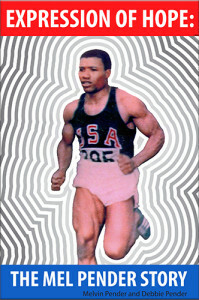 He was 31, much older than his athlete peers, but went on to win an Olympic gold medal in the 4×100-meter relay. 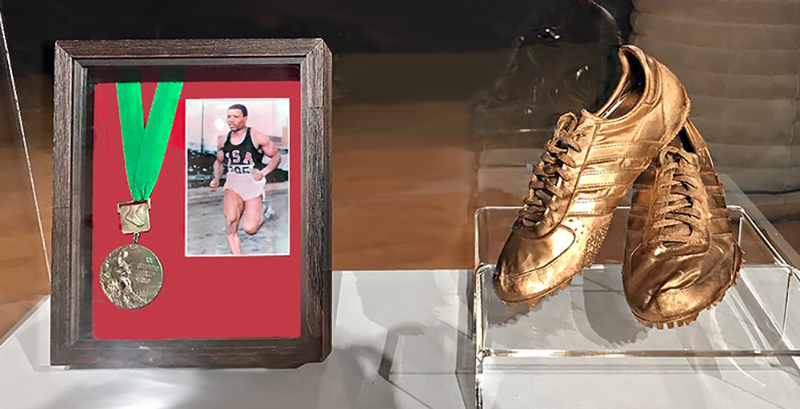 He next ran for the International Track Association and to this day still holds world records in the 50-, 60- and 70-yard dashes. Mel Pender has been inducted into 11 halls of fame. Captain Pender’s final military assignment was seven years spent at West Point Military Academy as the institution’s first African American track coach. There, he taught others to run and so much more. The camp I attended at West Point was my first experience with track and field. I didn’t know what talents I possessed, so Captain Pender gave me my first shot at everything…the 100, 200, 400, hurdles, triple jump, long jump, and I think I tried shot put and javelin, too. I went on to run track in high school, ultimately becoming captain of the track team. I also ran in college, finally narrowing my focus to the 400-meter dash, one of the most challenging events, as well as the mile relay, where I was a freshman member of the gold medal team at the Southern Collegiate Athletic Conference (SCAC). My talents fell far short of Olympic speed at Captain Pender’s camp, and in high school and college, but I found my stride and immense personal growth, which I fully credit to training under Captain Pender. My coach taught me that in life, both personally and professionally, we might have to try a lot of different things before we find our true north. There was a mix of older and younger kids at Captain Pender’s camp, and at age 12, I felt like a deer in the headlights among the cool, older teenagers. There were also a ton of ballers, and I’ll never forget the female athletes from Tennessee State University Lady Tigers track and field team. These powerful, not-to-be-messed-with athletes would do this bomb chant song about the Olympic champion Tigerbelles, also legends in their own rights. The instructors under Captain Pender included many other Olympians. Due to his military background and athletic discipline, he ran a training camp that nurtured the individual talents, abilities and efforts of every child and young adult in the program. That experience stayed with me. It taught me the value of striving to run an organization that helps individuals rise to their natural abilities, and how each contributes to the success of the entire team. At the end of camp at West Point when we had our big meet, I didn’t win anything. In fact, I got smoked in a lot of events. In some cases, embarrassingly so. 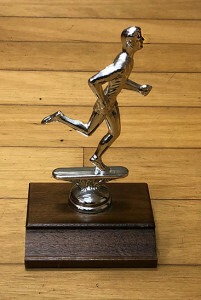 After everyone on the team was recognized, Captain Pender gave me an award he called “The Monster Man” – because I was “willing to try anything.” It was a little thing but meant more than I can say, and of course I still have it. Captain Pender taught me how small moments can have the biggest impact – and how important it is to reward effort, not just results. As a business owner, this is something I strive to do on a continual basis. One of the most valuable things Captain Pender taught me was proper form, and how mentors don’t have to be the same as those to whom they impart understanding. He was five feet, five inches tall. I was on my way to my current six-foot-two. I didn’t have the tight, compact, muscular build he had, but because of him, my form was beautiful. He had the most relaxed face when he ran and when he coached. He taught me not to clench and strain, and as I developed in the sport, my form became my very own. 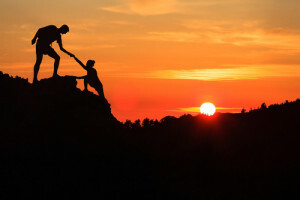 As I became a man and business owner, I have never forgotten that good form is achieved not by clenching and straining, but by channeling that energy and drive in ways that help me, and those around me, greatly improve our strides in work and life. I am grateful for all I learned and continue to learn from a great man. Dr. Pender’s civilian career as an entrepreneur, business owner and community leader grew in 2016 to include author, when he and his co-author and wife, Reverend Deborah Pender, published Expression of Hope: The Mel Pender Story. The book chronicles Dr. Pender’s journey from growing up in impoverished and segregated worlds in the South, to his distinguished military and athletic careers, and beyond. It’s a must read for lovers of Georgia history, the military, sports and winning in life. I will close by encouraging community-minded Georgians to get involved with or support Georgia Humanities, the nonprofit that ensures humanities and culture remain integral to the lives of Georgia citizens. It is an honor to serve on the board of this cultural state leader.